Oven roasted vegetables have a deep, naturally sweet, concentrated flavor. They require little effort and a minimum of fat. The hardest work is the veggie prep. Roasted vegetables are perfect on a party menu because they can be served warm or at room temperature, especially when topped with a vinaigrette or creamy sauce. Roast vegetables of similar density. For example, potatoes, carrots and turnips are hard vegetables. 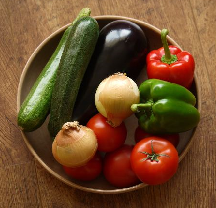 Peppers, zucchini and eggplant are medium-soft vegetables. Oven roasted vegetables shrink A LOT, so prepare a lot. Top with salt and pepper if desired. Use dried herbs such as oregano, thyme and savory at the beginning of roasting. 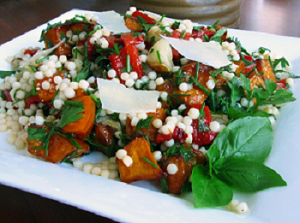 Roasted Sweet Peppers: Use red, yellow and orange. Green peppers are often too thin to roast properly. Cut off the tops of the pepper, cut in half and remove the seeds and veins. Cut in half and press down to flatten. To remove the skins: the easy method is to cover the peppers with a piece of paper towel. You can also invert a glass bowl over the peppers or transfer peppers to a large bowl and cover with plastic wrap. Either way, let peppers steam for 10-15 minutes. Using your fingers, peel off blackened skin. DO NOT rinse or you will rinse away the flavor. Cut peppers if desired and place in an airtight container with any liquids. Serve on salads, sandwiches, pasta, pizza and on and on! Roasted Tomatoes: Use Roma (plum) tomatoes or large cherry tomatoes. Regular tomatoes are a little to juicy for roasting. Cut tomatoes in half lengthwise. Place on baking sheet in a single layer and drizzle with olive oil and season with a little salt and pepper. Oven roast tomatoes until soft and shriveled, 35-60 minutes. Place in an airtight container with any liquids. Store in the fridge. Roasted Onions: All onions are good for roasting; red, yellow or white. Also use cipoline and shallots. Make sure the onions are firm with no blemishes or dark spots. Remove excess or loosened skins but do not peel. Place onions in a baking dish, add about a 1/2 inch of water and cover with aluminum foil. Bake at 375 F about 1 hour. Remove foil and roast the onions another 15-20 minutes until they are tender when pierced with a knife and slightly charred around the edges. All cooking times depend on the sizes and number of onions. To make roasted vegetables one day in advance; peel and clean carrots and store in sealed plastic bags. Cut onions and squash and store in tightly sealed plastic bags. Wash and peel potatoes. Leave whole. Store in the fridge in a bowl of cold water, tightly covered. Preheat oven to 425ºF. Toss trimmed asparagus in olive oil to coat. Lightly season with salt and pepper. Place stalks in a shallow baking dish, no more then 2 stalks deep. Sprinkle with a few tablespoons of water. Roast asparagus for 15 minutes, stirring at least once. Check for doneness and continue cooking until tender, 5-8 minutes more. Place the potatoes and carrots in a shallow casserole large enough to arrange them in one layer. In a small bowl combine the water, lemon juice, thyme, salt and 1 tablespoon of the olive oil. Pour over the veggies and nestle in the bay leaves. Bake, stirring occasionally to prevent sticking, until most of the liquid is absorbed and they are very tender, 45 minutes to 1 hour. Add additional water if veggies began to stick. Toss potatoes and carrots with the remaining tablespoon of olive oil and return to oven for 10 minutes until glazed and golden brown. Discard the bay leaves. Test for salt and black pepper. Line a shallow baking pan with parchment paper. Place squash cut-side down in pan. Bake at 350ºF for 30 minutes. Turn squash cut-side up; brush with butter. Sprinkle with salt and cinnamon. Meanwhile, combine rice, applesauce, celery, pecans, brown sugar, onion powder and ginger. Fill squash evenly with rice stuffing. Bake, uncovered, 20 to 30 minutes. Cook fregola according to package direction. While the pasta is cooking, make the vinaigrette. Whisk together the vinegar, mustard, salt, pepper and garlic in a small bowl. While whisking, pour in the olive oil in a slow stream until the vinaigrette thickens. Drain the fregola to a mixing bowl. Add 2 tablespoons of the vinaigrette to the pasta and toss to combine. Add the roasted peppers, feta and basil, and stir well. Add additional vinaigrette to taste. Serve at once. To toast walnuts: Spread the nuts on a baking sheet and lightly toast in oven until just fragrant, about 8-10 minutes. Remove, let cool. Alternatively, place nuts in a small dry, non-stick skillet over low heat. Toast nuts slowly, stirring around occasionally until fragrant, about 8 minutes. Prepare beets as directed above. Peel the cooled beets with a sharp knife. Cut them into 1/2-inch wedges. Toss the beets with the shallots and the walnut oil. Toss the watercress and the lettuce with a teaspoon of lemon juice and 1 tablespoon of olive oil and season with salt and pepper. Place salad on individual plates (or one large serving platter) and place beets to one side of the lettuce. Sprinkle with walnuts and parsley and Horseradish Cream or dressing of choice. Combine the juice, vinegar, salt and sugar in a small jar or bowl. Cover and shake or stir to blend and dissolve salt and sugar. Add oil, zest and pepper. Shake or stir again. Taste for seasonings. Add herbs just before serving. In a small jar or bowl, combine the juices, vinegar and sugar. Slowly whisk in the oil until emulsified. Taste for salt and pepper. Add herbs just before serving. In a small bowl, combine the horseradish, mustard, cream, a little of the lemon juice and olive oil. Season with salt and pepper to taste. Whisk lightly.